"Hercules Action Game" redirects here. For the game based on the 1995 TV series, see Hercules: The Legendary Journeys (video game). 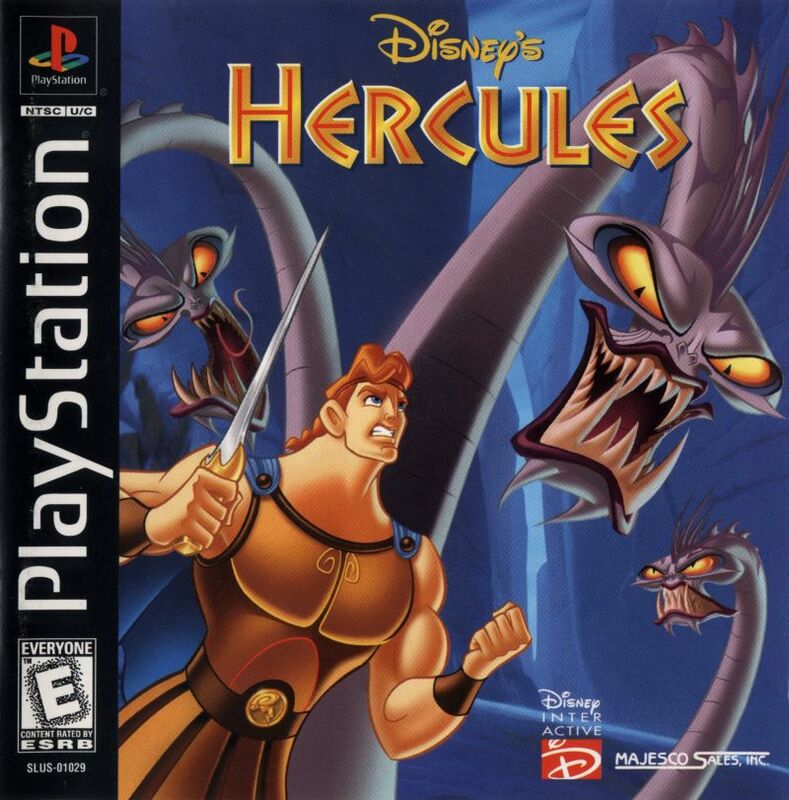 Disney's Hercules, also known in Europe as Disney's Action Game Featuring Hercules, is an action video game for the PlayStation and Microsoft Windows, released on June 20, 1997 by Disney Interactive, based on the animated film of the same name. It was released a week prior to the film's release. Another game based on the film was released for the Game Boy by THQ in 1997. The game follows the same storyline from the animated film. Hercules, son of Zeus, is stripped of his godhood and must prove that he is a true hero in order to regain his immortality, and join Zeus and the other gods on Mount Olympus. To do that, Hercules must pass several tasks and defeat many villains, and at the end, face Hades, ruler of the dead, who is also responsible for Hercules' losing of his immortality. The game is mainly two-dimensional, although, in many missions the player can walk to other planes via pathways or stairs. There are ten levels and three difficulty modes: Beginner, Medium, and Herculean. The last two levels are playable only on Medium and Herculean difficulties. There are three rush levels in the game in which the player must run forward through the map and avoid obstacles without being able to stop or fight. The player's health is measured in the energy bar shown in the upper left corner for normal levels or bottom left for rush levels. The energy bar can be increased by picking up Hercules Action Figures (also known as Herculad) and the energy can be replenished by drinking Herculade cups found throughout the game. The player's main weapon is the sword; Hercules can also punch, but this is a much more difficult way to defeat enemies. Weapon powerups, known as Gifts of the Gods, can be found throughout the game, consisting of the Lightning Sword (shoots lightning any direction Hercules aims when selected and fired), Fireball Sword (shoots fireballs that seek out onscreen enemies when selected and fired), and the Sonic Sword (affects enemy targets at close range with a circular sonic blast when selected and fired). There is also an invincibility , found in the game in the form of a helmet, which grants the player a few seconds of invulnerability when activated. Powerups have limited action, and once their energy has depleted, they can no longer be used. In many levels, there will be hidden letters that if all collected, will form the word HERCULES and will allow the player to spawn directly at the next level, instead of starting the game all over from the beginning. There are also four hidden vases in each mission, that upon collection, will give the player a secret password for the current level, which they can later use at the game start screen to spawn at the level from which the vases were collected. During the game, the player will face many bosses, most of which can't be defeated by conventional fighting and require the player to perform special actions to pass. Among the enemies that Hercules will face are Nessus the Centaur, the Minotaur, the Harpies, the Hydra, the Gorgon, Hades, several Titans, and a Cyclops. The PlayStation version of the game was re-released by Majesco Sales in 1998 with an E rating (which replaced the ESRB's "Kids to Adults" rating the same year) and the words "Action Game" removed from the title. On March 8, 2011, the PlayStation version of the game was re-released as a PSOne Classic on the PlayStation Store. Next Generation reviewed the PlayStation version of the game, rating it two stars out of five, and stated that "There's something to be said for reenacting scenes from the movie on your TV screen, and fighting the Hydra or Cyclops is sure to please the younger audience this game (and the movie) is aimed at. However, there's also something to be said for making games that push forward, not fall back." The game received positive reviews, with the PlayStation version holding an aggregated review score of 80% on GameRankings. At the 1999 Milia festival in Cannes, Hercules took home a "Gold" prize for revenues above €15 million in the European Union during 1998. ^ Froholt, Joachim (January 23, 2009). "Ukens nettutgivelser" (in Norwegian). Retrieved October 1, 2016. ^ "Scan of 1998 PS1 release cover". ^ "Disney's Hercules (PSOne Classic) on PS3, PS Vita". ^ "Finals". Next Generation. No. 34. Imagine Media. October 1997. p. 169-170. ^ "Disney's Hercules Action Game for PlayStation". GameRankings. Retrieved May 15, 2017. This page was last edited on 22 April 2019, at 11:41 (UTC).